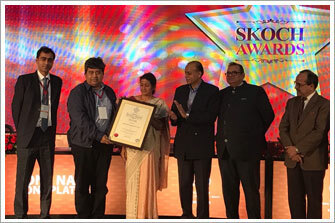 Adding yet another feather to its cap, Avenues India, the country's leading eCommerce solutions provider recently received accolade at the prestigious Skoch Payments Award, held at The Constitution Club of India in New Delhi. 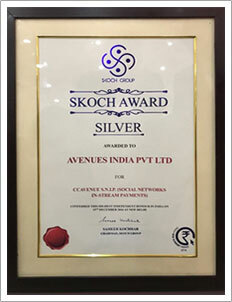 Avenues bagged an award in the 'Silver' category for its flagship brand CCAvenue's proprietary social media payment system, CCAvenue S.N.I.P. The Skoch Payments Award was hosted a part of the 46th SKOCH Summit organized by Skoch Group on 15th December, 2016. It aims at recognizing and rewarding top performing technology users, technology implementers and technology providers across sectors, organizations and departments. Coveted for its unique approach in selection of awardees, Skoch Awards follows a rigorous process of selection, by an eminent jury of industry leaders, domain experts, economists and academicians. Since 2003, Skoch Awards is regarded as one of the highest independent awards in India. CCAvenue earned recognition for its disruptive social commerce facility, CCAvenue S.N.I.P. The service allows merchants to monetize their social media presence and set up their online business in less than a minute, at zero cost. Businesses can use the platform to sell products and collect payments instantly through a payment link on their social media pages, and also via a QR code for offline transactions. Commenting on the latest accomplishment, Mr. Vishwas Patel, Chief Executive Officer at Avenues Group said: "Since its inception, CCAvenue has been at the forefront to offer eCommerce businesses with the most advanced payment solutions to help them take their business to the next level. Likewise, with CCAvenue S.N.I.P., we are enabling merchants to expand their business opportunities by tapping into 180 million active and growing social media user base in the country. Today, SMBs, micro-entrepreneurs, work-from-home professionals are availing the facility to kick-start and grow their business through Facebook, Twitter, WhatsApp, and so on. We would like to thank the jury and organizers at Skoch Group for this recognition. The award bears testimony to CCAvenue's pioneering contribution in the field of eCommerce and digital payments". In addition to the Skoch Silver Award, CCAvenue also achieved the Skoch Order-of-Merit for qualifying amongst the top 100 projects in the country. A jury of eminent experts made this selection after going through a large number of nominations and presentations. Being a leader in the online payments space, this recognition will further inspire CCAvenue in developing innovative solutions backed by state-of the-art technology to accelerate the growth of eCommerce businesses in India. CCAvenue.com has a string of several other awards to its credit including 'Best Digital Payment Facilitator' twice in a row from IAMAI, 'Best eCommerce Payment Innovation' from Franchise India, 'Digital Innovations in the SMB Sector' from Cisco and CNBC-TV18, and more. Headquartered in Mumbai, CCAvenue is a payments platform for ecommerce businesses in India. CCAvenue is designed to help its 1 lakh+ merchants accept online payments through a spectrum of new-age payment options including 6 major Credit Cards, 98+ Debit Cards (All MasterCard /Visa /Maestro /RuPay Cards), Amex EzeClick, 53+ Net Banking, 48 Bank IMPS, 16 Prepaid Instruments and up to 12 Multi Bank EMI options. CCAvenue now also offers UPI (Unified Payments Interface) and will soon be adding BBPS (Bharat Bill Payment System) payment facility on its platform. Backed by a 15-year history of industry firsts, outstanding innovations and prestigious accolades, CCAvenue offers a multi-channel payment platform, along with a bunch of disruptive features such as CCAvenue Checkout, CCAvenue S.N.I.P., CCAvenue Store Front, CCAvenue Card Storage Vault (tokenization) and more. CCAvenue has successfully achieved the ISO/IEC 27001:2013 certification in addition to being PCI DSS 3.2 compliant.